Preheat oven to 400 degrees F. Cut potatoes in small quarters leaving pealing on. Mix Good Seasons Dressing as directed on package. Place one layer of parchment paper in the bottom of 9x9 inch baking pan. 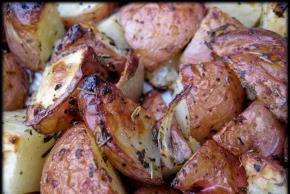 Place potatoes in the baking pan and pour half of the dressing over potatoes, sprinkle with salt and pepper. Toss lightly with spoon. Place on middle rack of oven for 30 minutes or until potatoes begin to turn light brown. Take potatoes out of oven and pour remainder of the dressing over them and give a light toss with the spoon. Then place them back into the oven for another 15-20 minutes or until potatoes are golden brown and done.